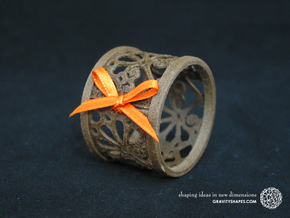 This lovingly designed small gift roll with filigree pattern convinces with its beautiful hearts design and filigree decorative lacing*. 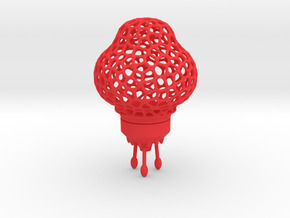 With a size of 6.1 cm and 2.9 cm in diameter it has an ideal size to attach to a package, bouquet or bunch of keys and offers space for letters, vouchers, money and other things. It is an ideal little gift box for any occasion, not only for Christmas, Valentines or Mother's Day. Note: To reduce printing costs, the lid is at the roll-bottom connected to the roll with a thin connection. However, this can be easily separated with a knife. 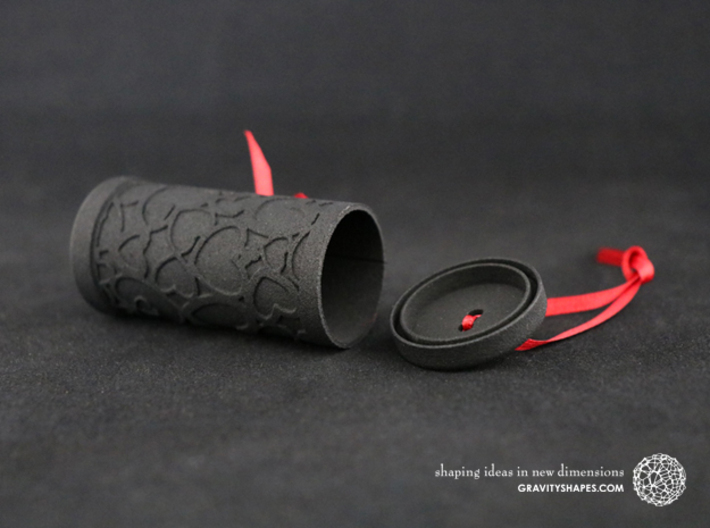 Decorated with your delicate lacing, the 3D printed and hand-crafted gift roll(s) are beautiful and lovingly crafted gift items which also fit well with other objects of the GRAVITYSHAPES collection. 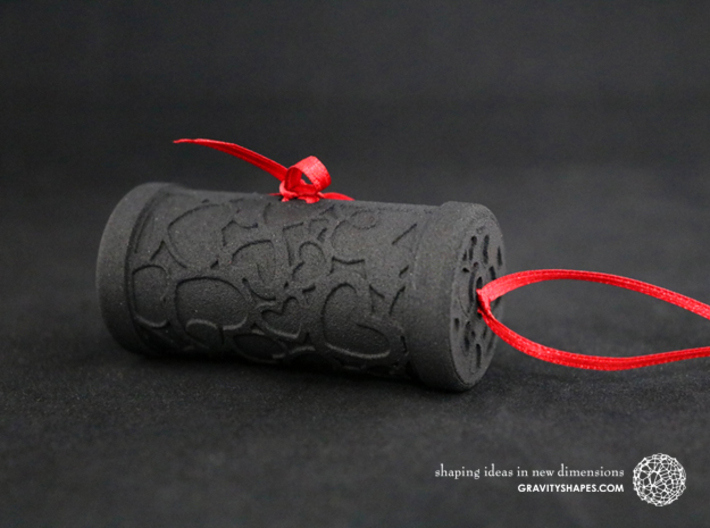 The 3D printed and handmade gift rolls from GRAVITYSHAPES are available in different sizes and and many different designs. They are beautiful and unique gift or bouquet pendants (the small sizes). 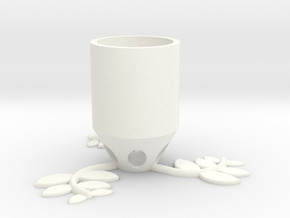 They can be easily attached to packages or bouquets thanks to the decorative lacing. The lids of the gift rolls are easy to remove. And you can place all sorts of surprises in it. Whether letters of love, congratulations or wishes for recovery, whether rolled business cards or envelopes, vouchers or cash, the different roll lengths and diameters leave many possibilities for use. 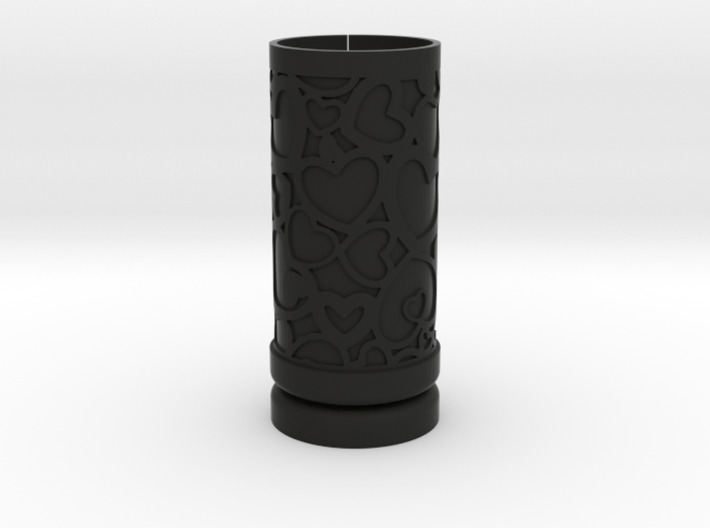 Different patterns (hearts, mosaics, Japan or oriental) are available. The same goes for the roll colour (material) and the very personal style and colour of the decorative lacing*. 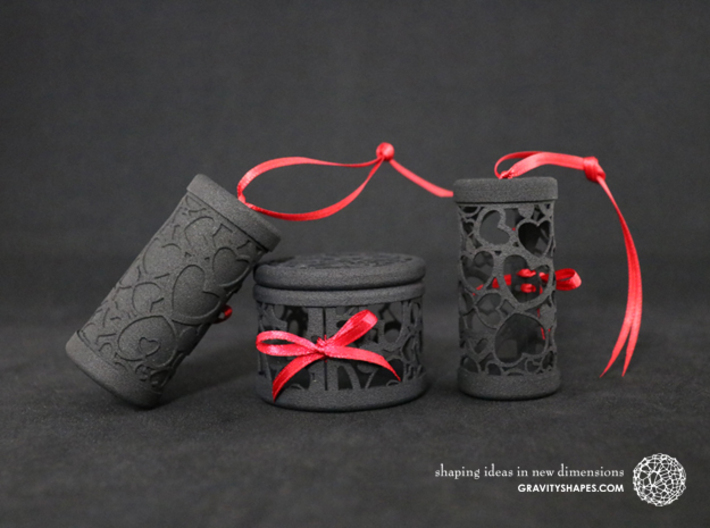 If you want to extend the decoration, you will find in the GRAVITYSHAPES collection, for example, various small and large boxes, tealight holders and more with the same patterns, which perfectly match the gift rolls and make the collection perfect. 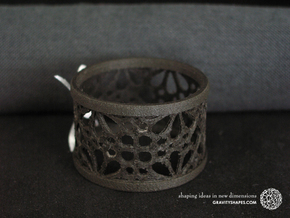 * The Lacing are not included: In this online shop you only buy the unlaced gift roll(s). Apply a decorative lacing in the colour of your choice and give the gift a very personal touch. We recommend a 3 mm wide satin ribbon for lacing. But you can also use thin cords etc.